Google's highly anticipated Gmail app for the iPhone, iPod Touch, and iPad enjoyed a brief moment in the App Store on Wednesday, but was quickly pulled because of a bug. 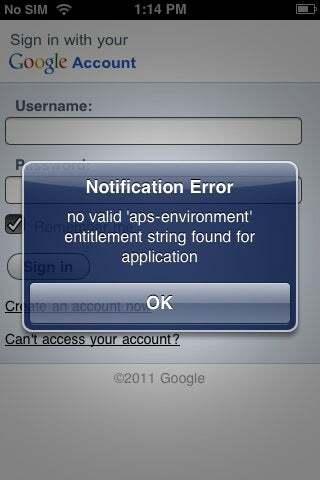 Upon opening the Gmail iOS app for the first time, users immediately saw a "Notification Error," with the following cryptic message: "no valid 'aps-environment entitlement string found for application." The error broke notification support, so Google removed the app shortly after launching it. "We've removed the app while we correct the problem, and we're working to bring you a new version soon," a note on the Official Gmail Blog said. "Everyone who's already installed the app can continue to use it." Bugs aside, the Gmail iOS app still needs more work. Scrolling is sometimes laggy, button taps can be slow to respond, and there's no support for multiple inboxes. It's not clear whether Google will add some extra polish to the app before it's sent off again for approval. This is the second time in a month that Google's had to remove an iPhone app because of bugs. Previously, the company pulled its Google Voice app from the iOS App Store because of continuous crashing in iOS 5. Google also had to fix several bugs in its Google+ iOS app a few months ago, but never removed the app from the store. Given Google's tendency to release products in beta form, these aren't huge surprises. Once the bugs are fixed, the Gmail app should have some redeeming qualities, including push notifications, multiple photo attachments, Priority Inbox support and the ability to scroll through entire conversation threads.